Yes looking very good indeed. 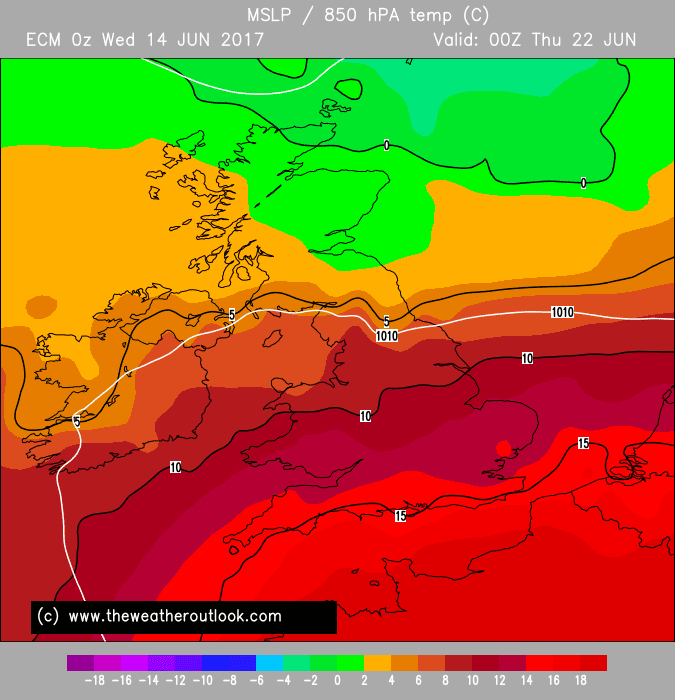 The Ecm 00z is showing a heatwave for the south with temps into the 80's for several days from the weekend. 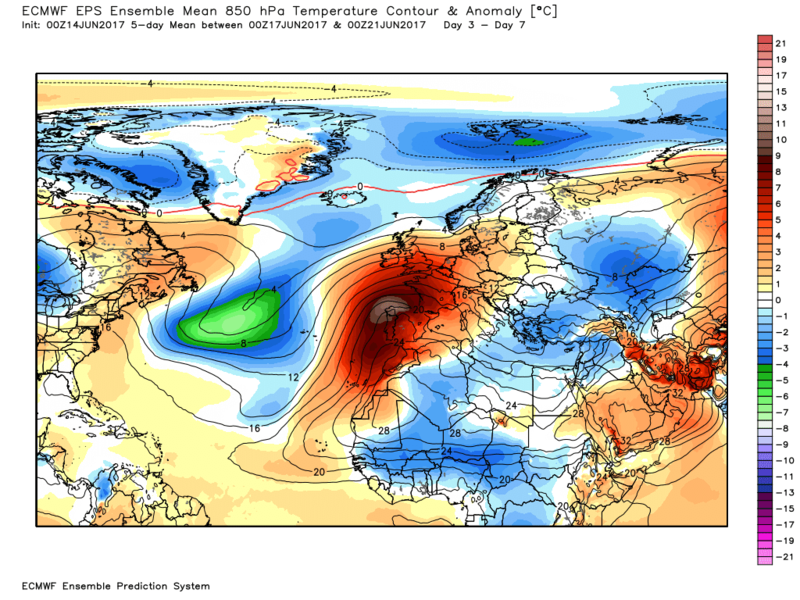 The ECM is fun for some heat early next week but looks to become an unstable mess before long and later heads down a route likely influenced by its keeness on a bit of phase 2 MJO activity which is not helpful. 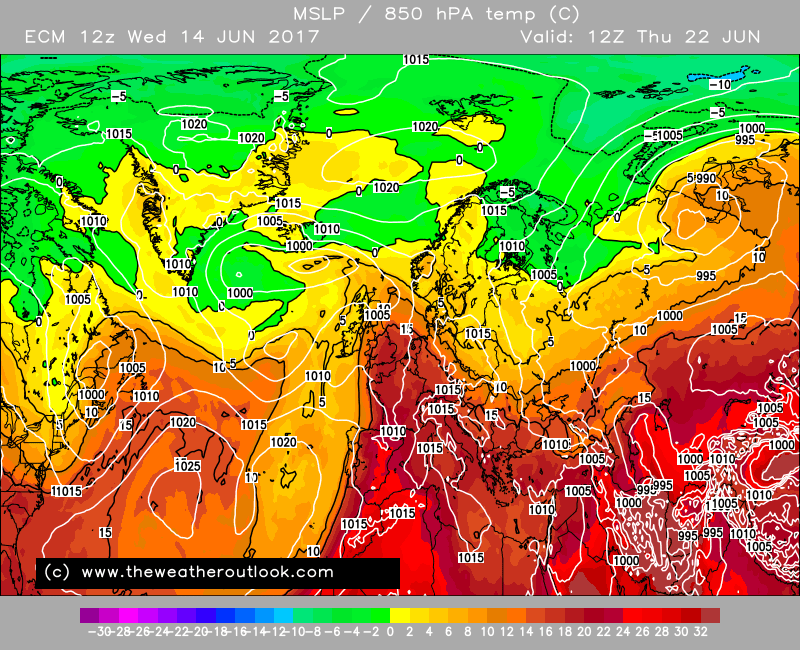 So funnily enough we now have GFS looking much better for stable and pleasant conditions going forward. 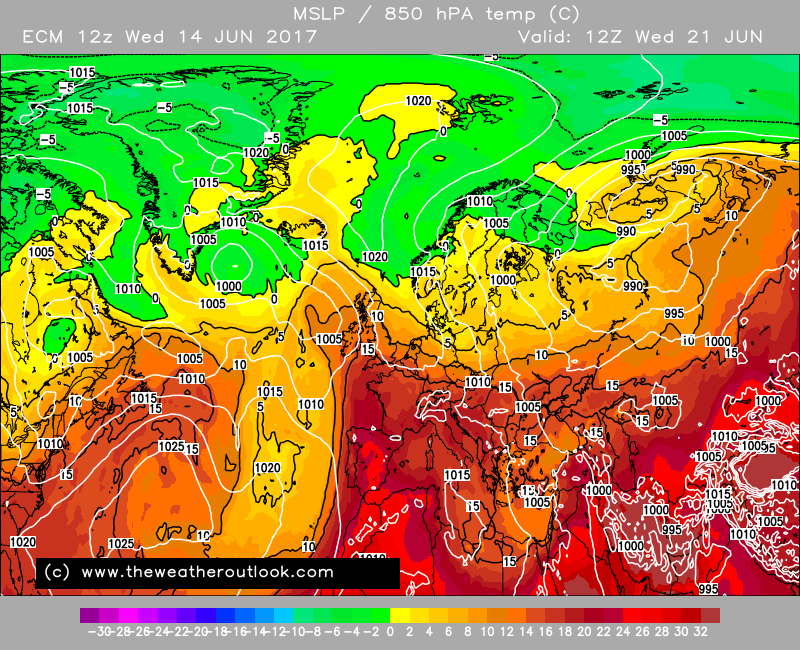 GEM is close behind having flipped to the extreme with respect to Mon-Tue such that it has the most influential Scandi through. 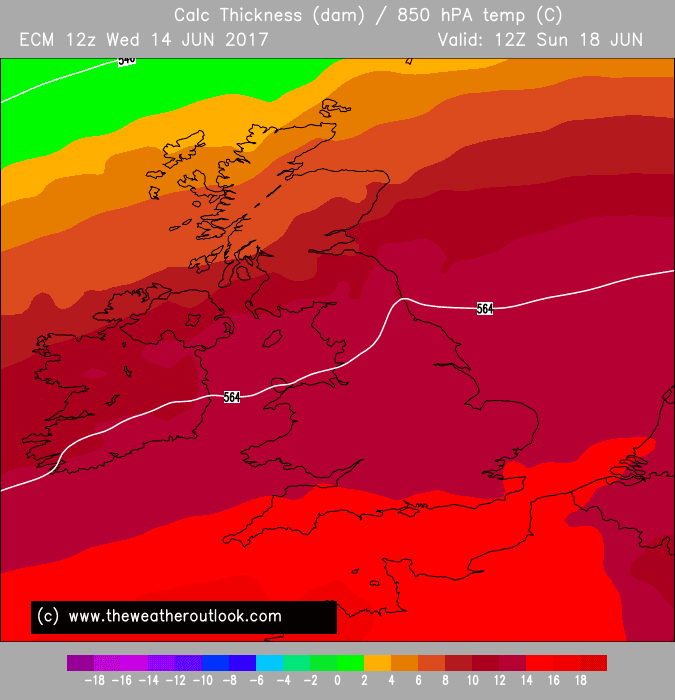 UKMO remains steady from the 12z and perhaps still on course for the low drifting north while close to the west of the UK. Or it may just linger to the S/SW. Best outcome of all when thinking ahead beyond early next week could be GFS 00z with a bit more adjustment east of the ridge position for Mon-Tue. 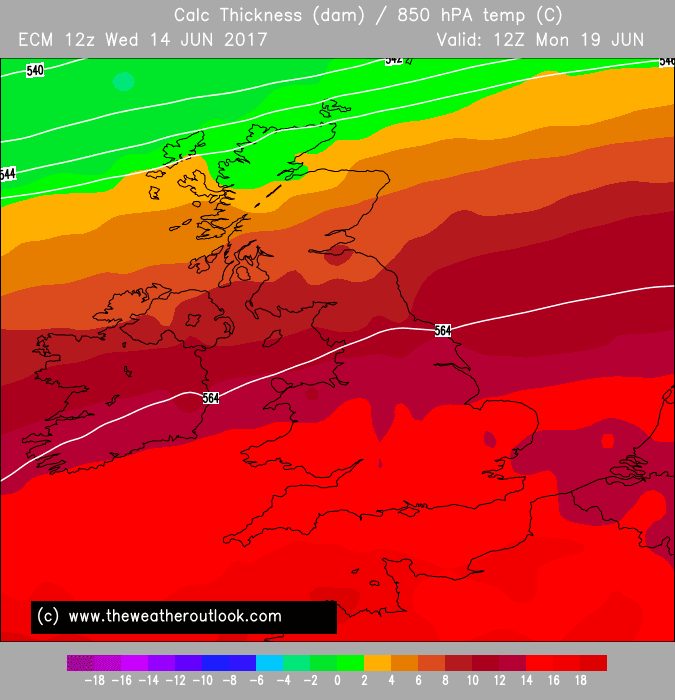 Not sure why people are looking beyond mon/tue for a breakdown already? 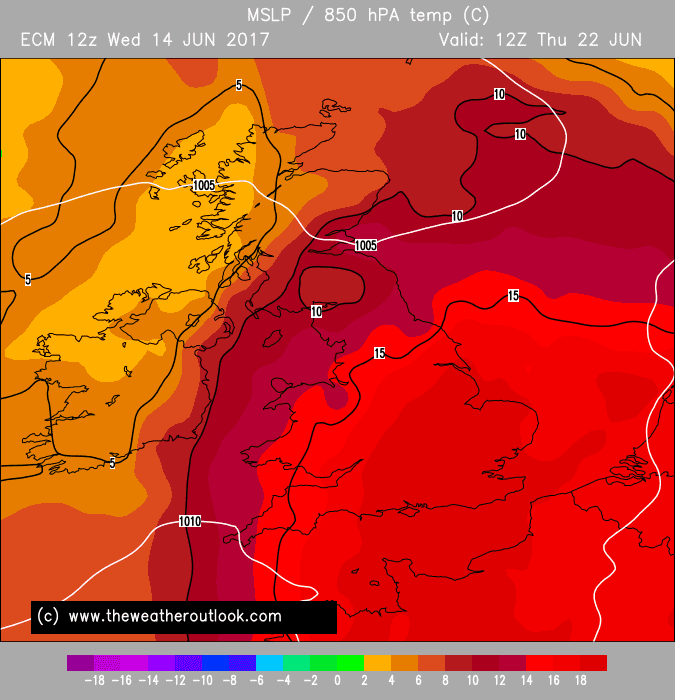 I don't think anyone was expecting a week long or more of warm settled weather? It's always the way, constantly living in the future! Most of us have got a lovely day right in front of us today.  Best enjoy it I say without worrying too much about next week. Especially given the reliable time frame at the moment is much closer than 144 hrs IMO. 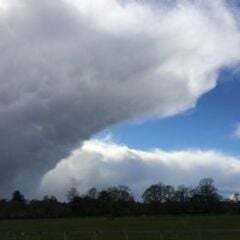 The ECM is a bit disappointing this morning compared to last night's offering, but then again that run was probably always going to be the extreme solution. 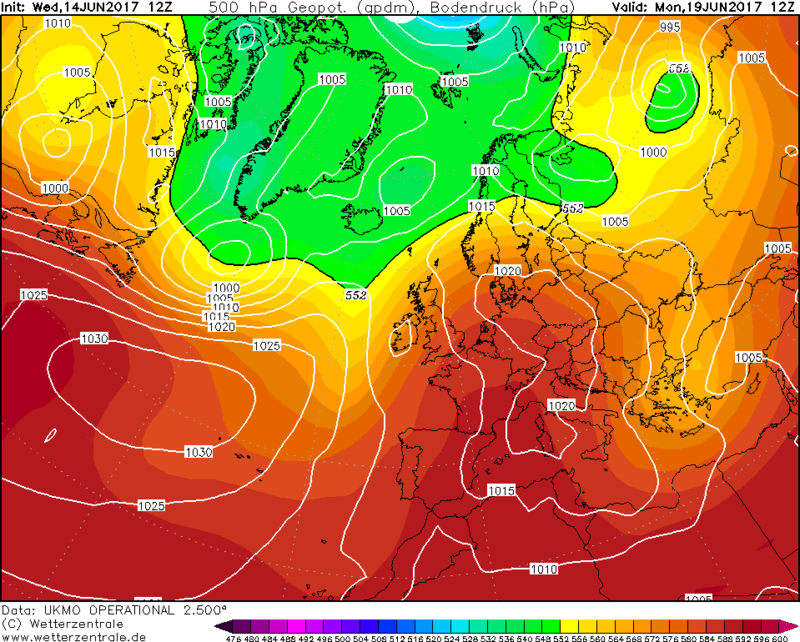 At least the GFS looks a fair bit better for Sunday and Monday this morning and high pressure is in control most of next week, albeit a cooler high. 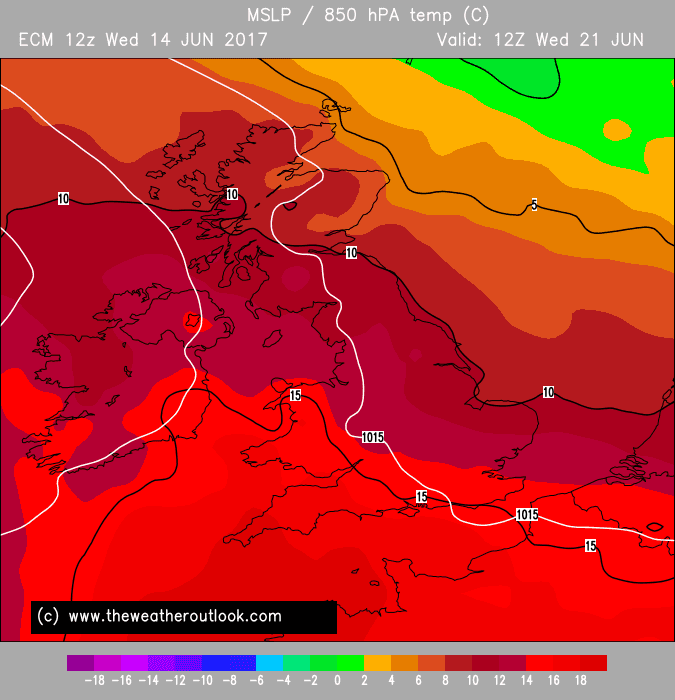 Could be another warm up though later on if the GFS is correct. 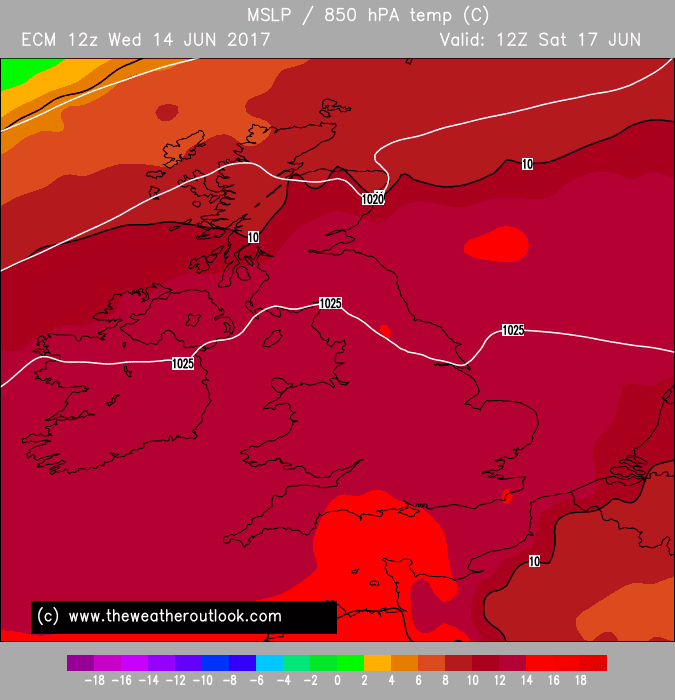 Exactly....I think last nights ECM was more than likely a warm or hot outlier! Todays is more than acceptable too. 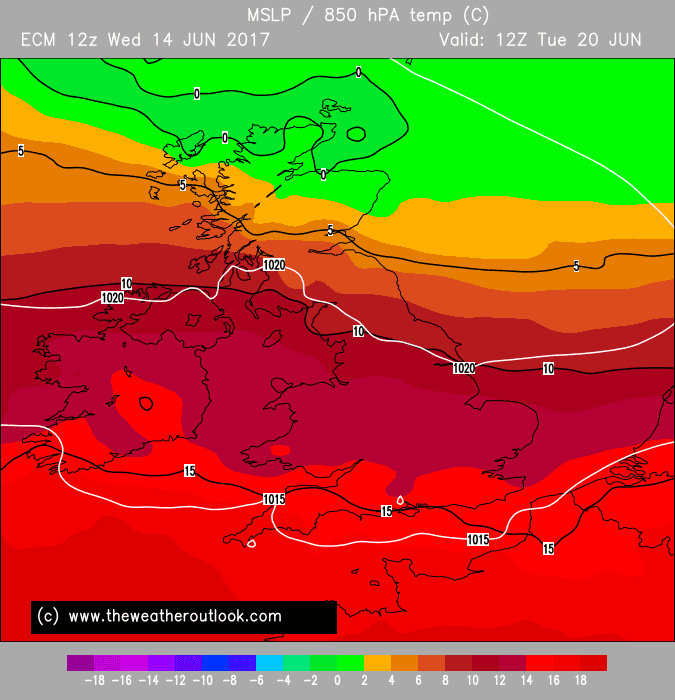 It's roughly a third of the GFS suite that favour the ECM outcome, with 2/3 still backing a trend down to cooler weather pretty quickly. 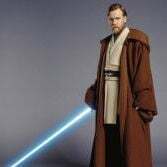 Perhaps something along the lines of the OP run would be ideal. Well it's a beautiful day across most of the southern half of the uk today with plenty of sunshine, unbroken hot sunshine for many and this is just a taste as following a fresher but still warm few days the weekend is set to hot up again with high pressure building strongly across the south with temps closing in on 30c 86f in the hottest spots and next week indicates more very warm / hot weather further south with a growing risk of T-Storms but cooler and more unsettled for the far NW. .
Who'd get into model watching eh! No deep low, completely different. More runs needed again! 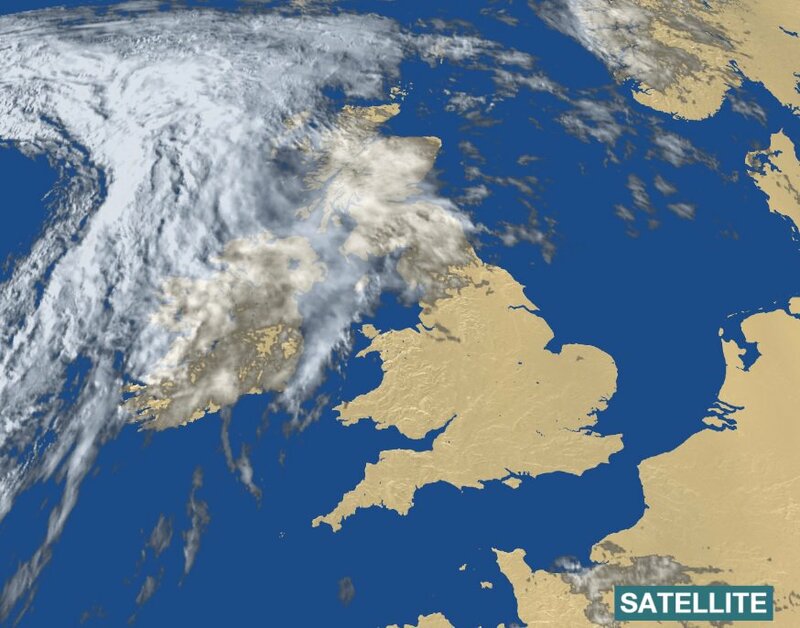 Let's see what the ECM makes of it all later. 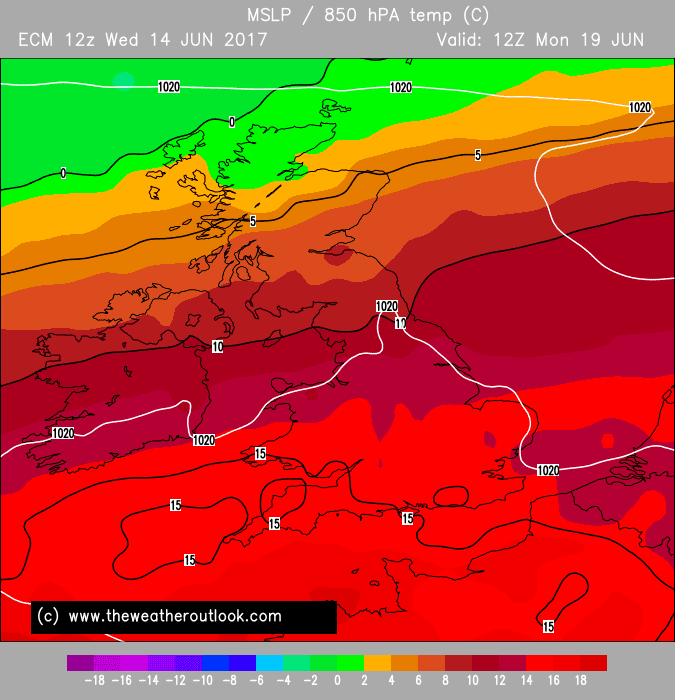 UKMO is a classic thundery breakdown after the heat peaks on Mon. The deepening low Tue would likely move close enough on Wed to produce a westerly/south-westerly flow with showers for ay least northern parts, but with a new ridge from the Azorew looking to turn things back around pretty soon (based on typical summer patterns - so not a given, but good chances if we end up as UKMO shows for Tue... A big if, though). 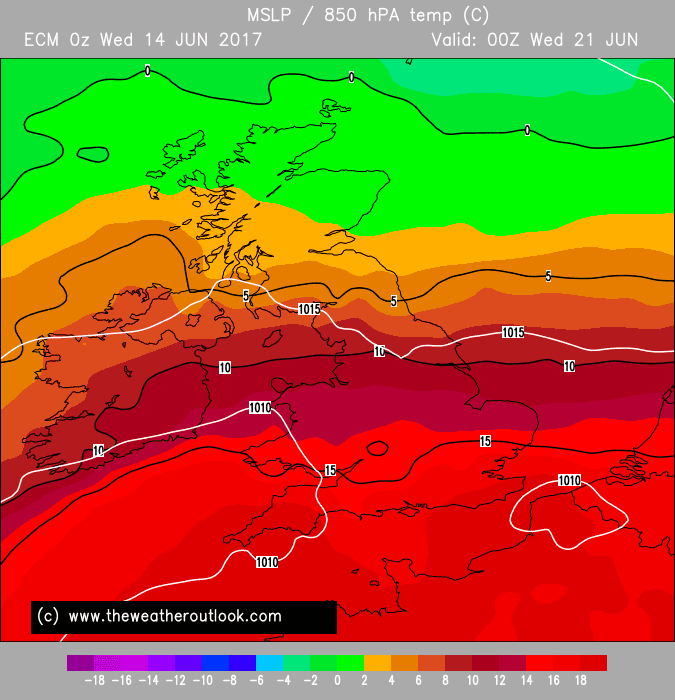 I think I speak for most on here when I say I hope we see charts like these repeating throughout this summer with the azores high building in followed by an injection of continental heat..rinse and repeat. 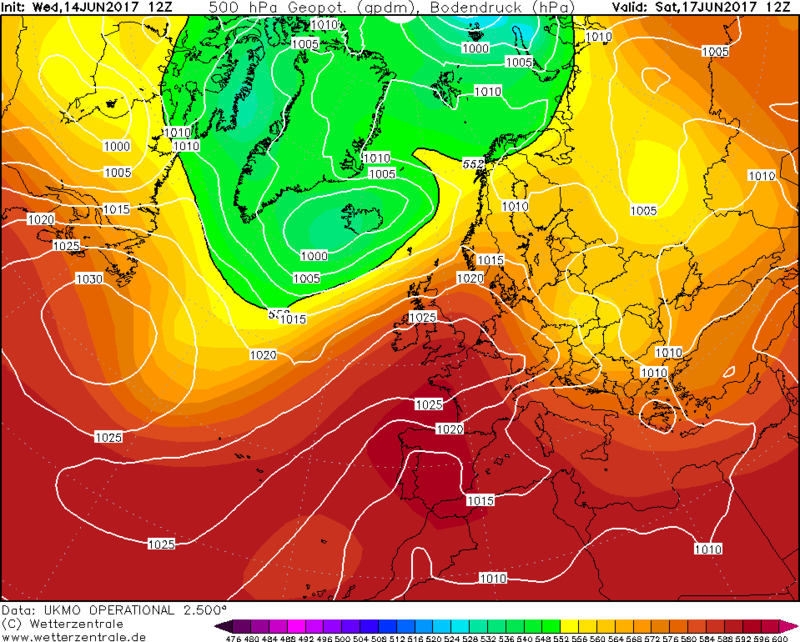 The GFS despite trying to push cooler weather south still keeps temperatures in the high twenties across the south on Monday now, the UKMO/Arpege and GEM all seem to want to veer the winds towards a southerly direction and really pull the hot air northwards though perhaps not reaching the far north. 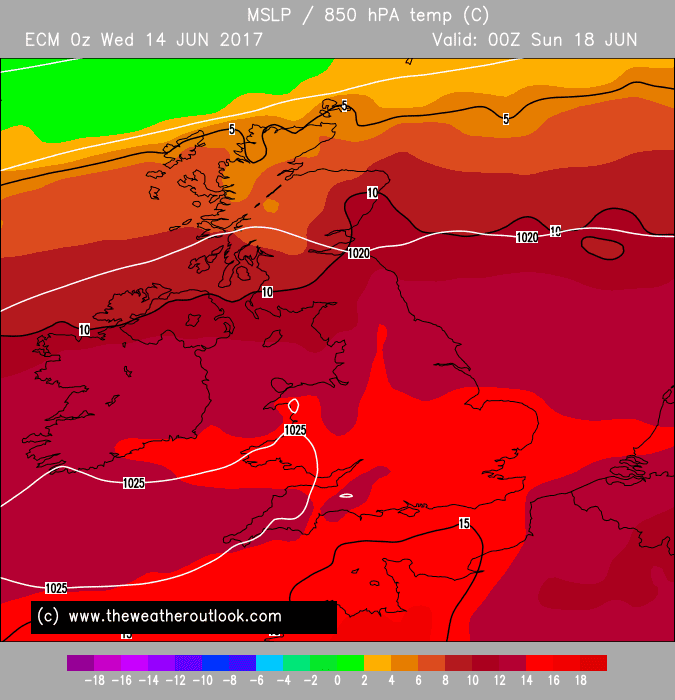 The UKMO day 5 is stunning with 90F certainly reachable considering the hotter airmass moving up from France plus heat building at the surface during the weekend. 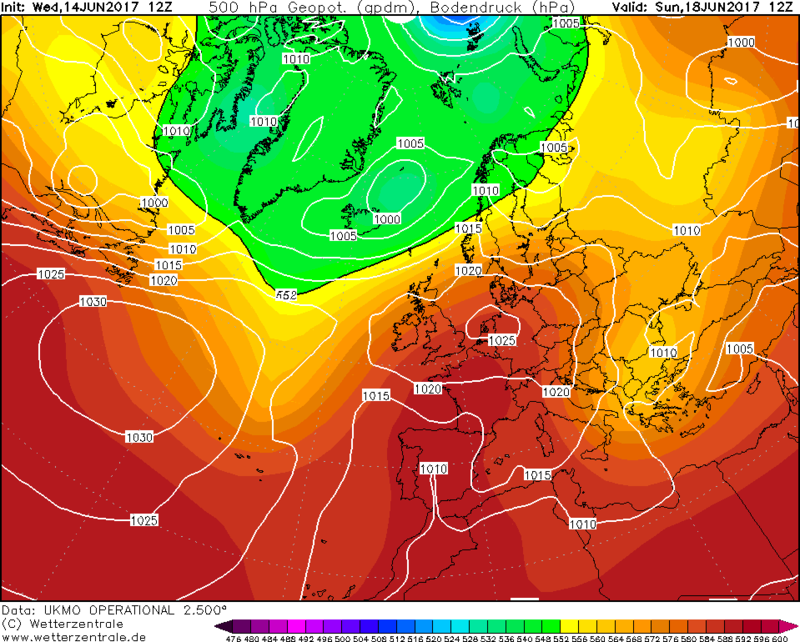 Arpege for the weekend looks impressive and could even be a candidate for the best summer weekend we will get this year. 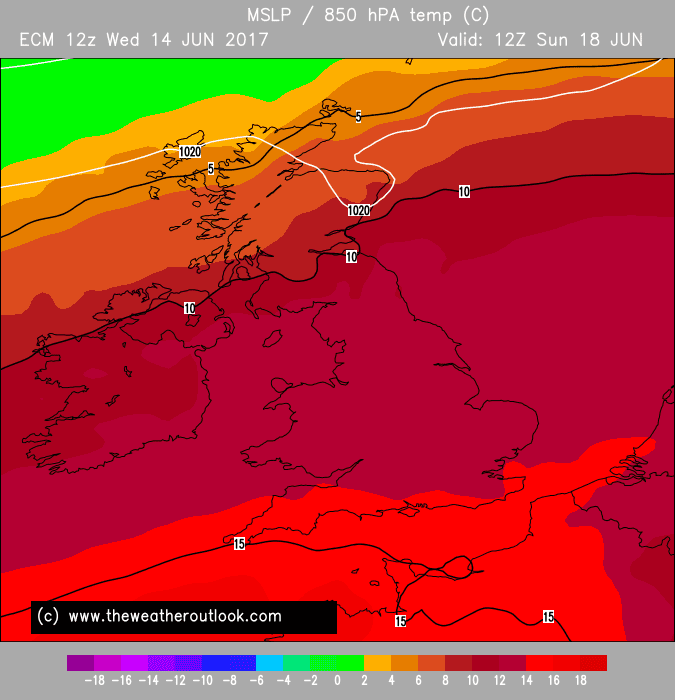 28C on Saturday and 30C on Sunday, mid to high twenties for a fair spread of the UK away from western Scotland where there will be the risk of rain. 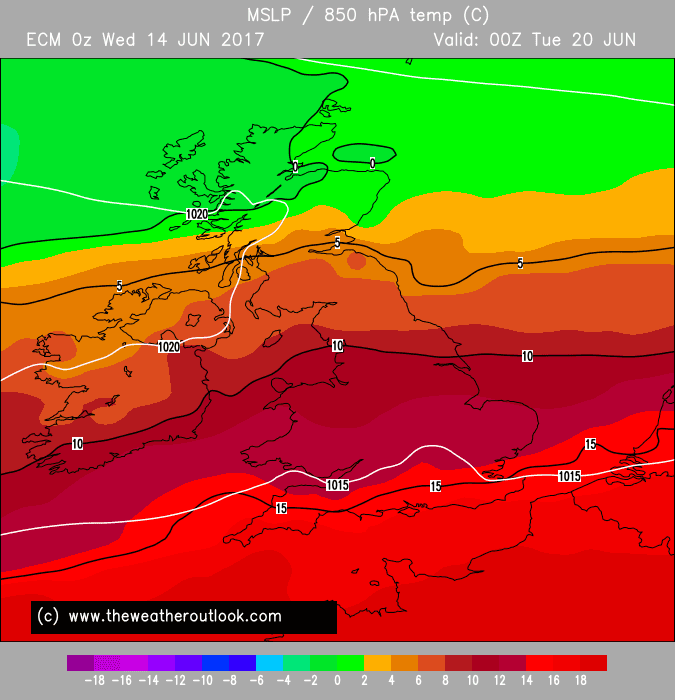 I agree, add this to the hot spell we got in May too, and it looks like 2 decent hot periods of weather will be in the bag before the third week of June. Not bad at all! Good news...ECM is fantastic too. So we should be all set for 3 crackerjack days from Saturday to Monday, then who knows what might happen after. Summer 2017 hasn't started off too badly.....just think how desperate the charts looked 2 weeks ago. Things change quickly. 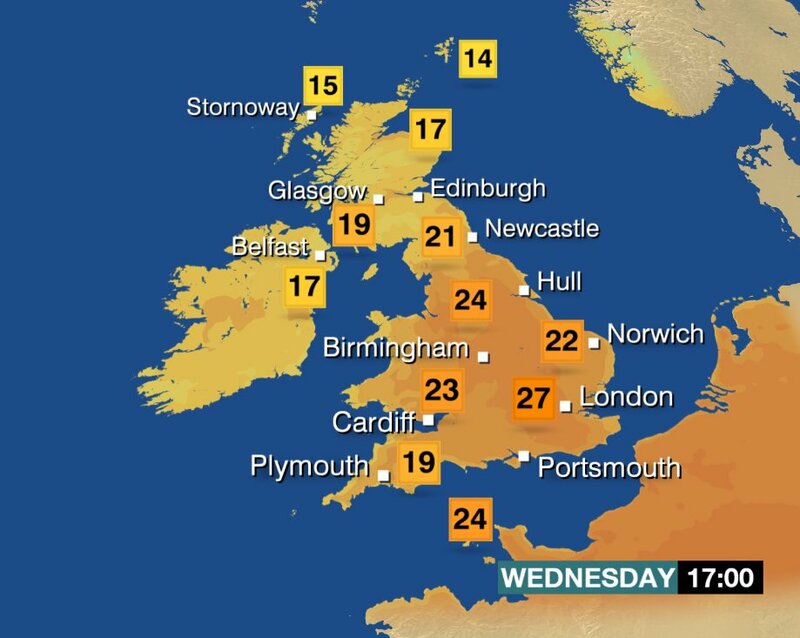 Phew what a scorcher..I'm in danger of melting! 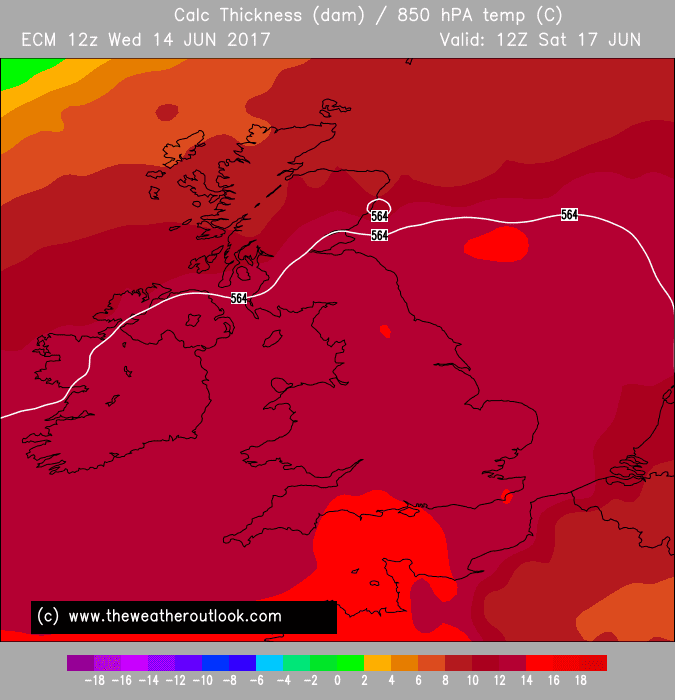 That would be an impressive heatwave for the south if the Ecm12z is right, heat extended until later next week..who knows, it could go on longer! looking further ahead here are the big 3 for comparison 144 hours . 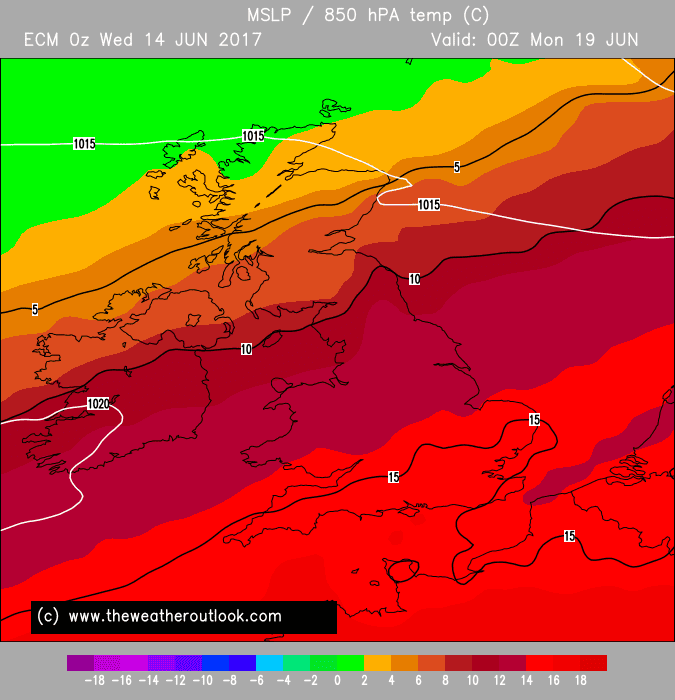 Well how about that; both ECM and GEM have more or less reverted to what they were respectively showing 24 hours ago! 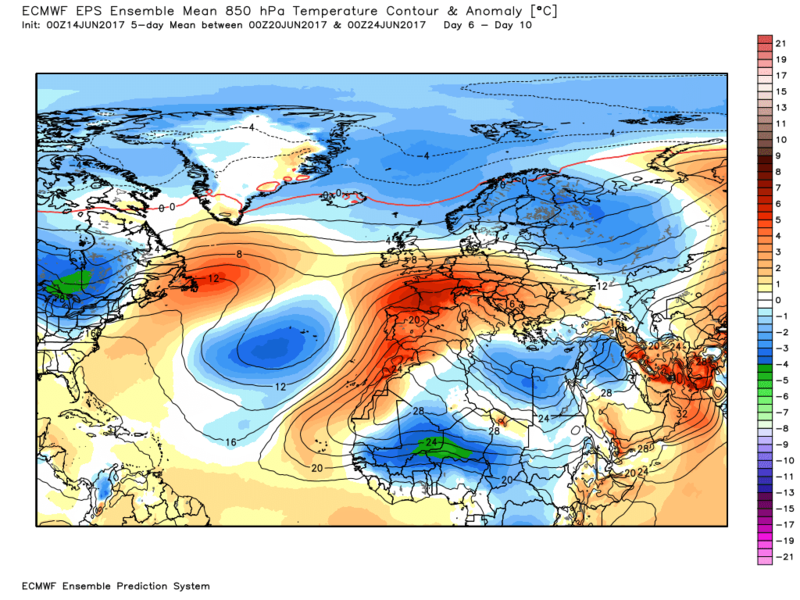 ECM still with the MJO phase 2 factoring in later but it has remained outside of 8 days range - the day of change being put back - which is encouraging if a repeating ridge scenario is to continue. 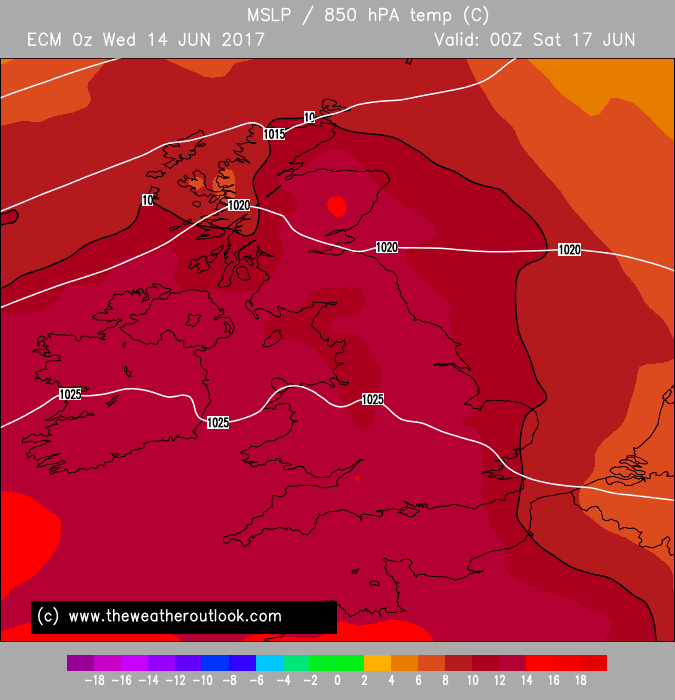 Anyway, odds on for at least three very warm to locally quite hot days in the south, perhaps even more than that if ECM or GEM pan out - possible blip Tue before a push back north; details beyond the weekend unclear as one would expect at this range.